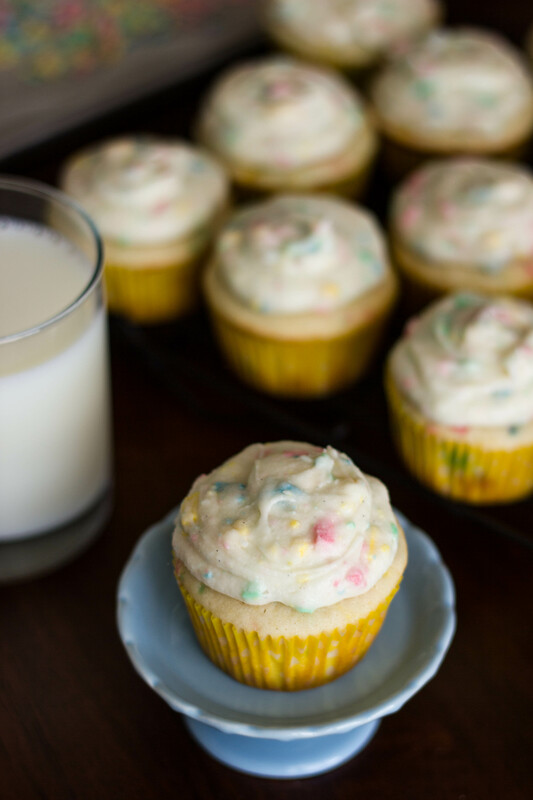 In the last year, Betty Crocker replaced their Rainbow Chip Cupcakes and Frosting with rainbow sprinkle and apparently fans have been outraged. They’ve even started a Facebook page called Bring Back Rainbow Chip Frosting. 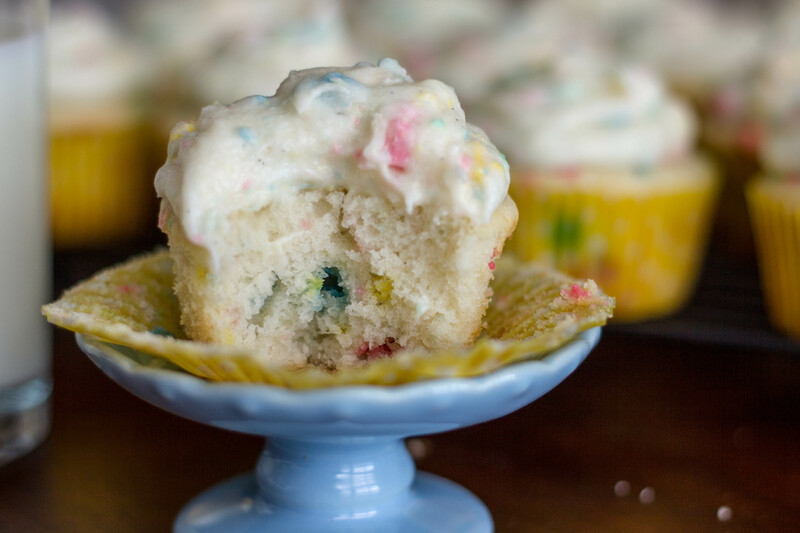 I think my mom mostly made funfetti growing up, but I do remember having rainbow chip a few times. 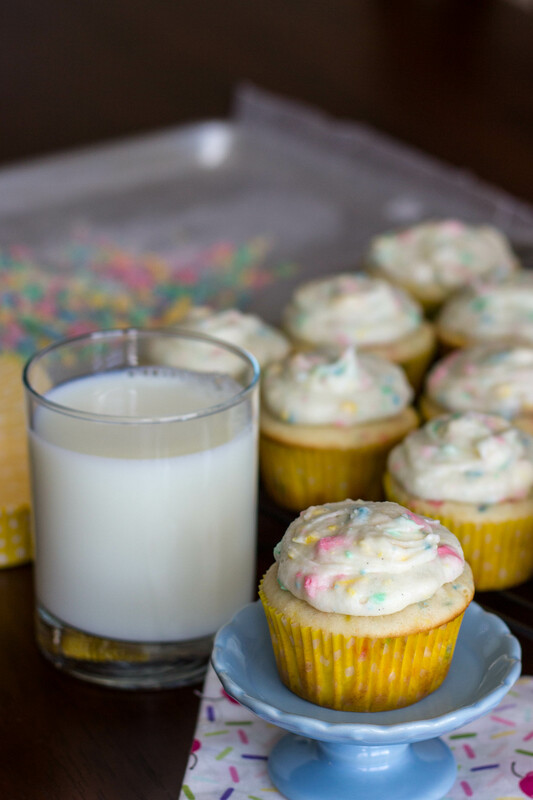 While they are both delicious, rainbow chip has small, soft “rainbow chips” throughout the frosting while funfetti just has sprinkles on top. 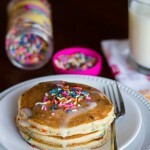 Betty Crocker’s Rainbow Sprinkle is definitely closer to funfetti than rainbow chip. 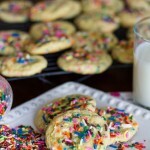 A quick google search led me to several recipes for homemade rainbow chip. 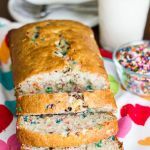 There seemed to be two main versions – one using Wilton Rainbow Chip Crunch Sprinkles and one with rainbow chips made from white chocolate. Right away I was on board with the white chocolate version. I hate recipes with ingredients I can’t easily find. After reading lots of reviews, it seemed like most people thought the white chocolate rainbow chips tasted more authentic. People consistently complained that the rainbow chip crunch sprinkles were too “crunchy”. 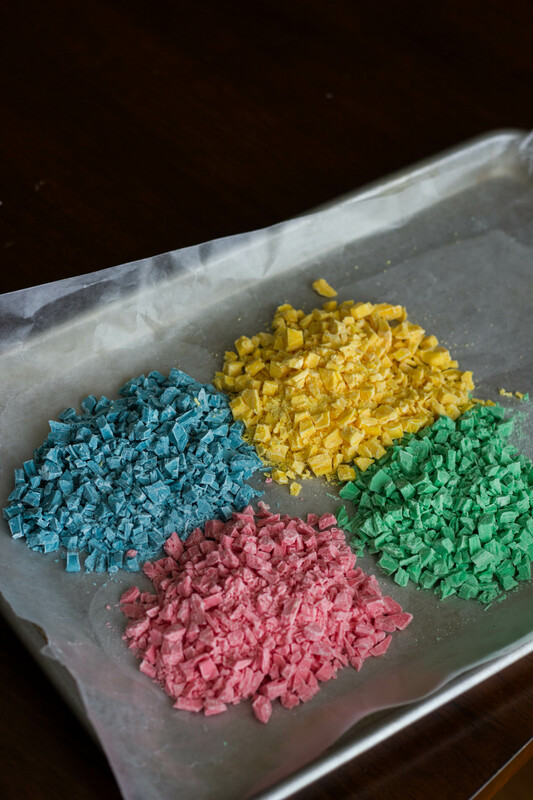 Homemade rainbow chips are super easy. 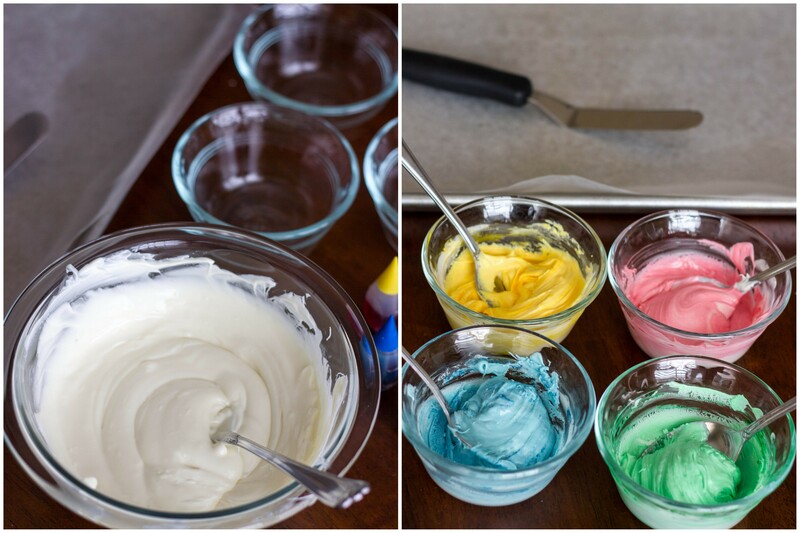 All you do is melt the white chocolate chips, divide into 4 portions, and add some food coloring. 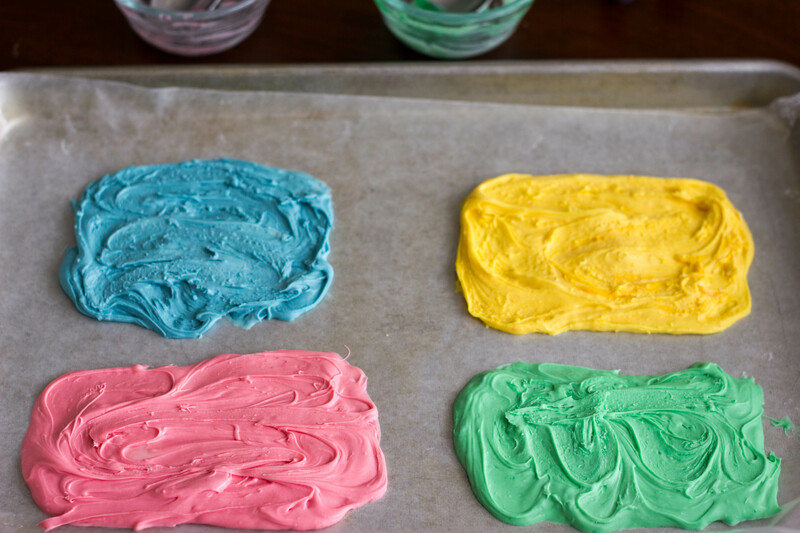 Spread the colored chocolate onto wax paper, let it harden for 10 minutes, and then chop it into small pieces. When I said easy, I meant it! I used my favorite white cake recipe (the same one I used for my Funfetti Cake) but followed the recipe for the frosting to a tee. The rainbow chips make the frosting hard to pipe (even through a large round tip) so I ended up spreading my frosting on with a knife. Despite the cream cheese, the frosting is pretty sweet so you may not want to pile the frosting too high (I had a small amount leftover). It’s been at least 15 years since I’ve had “the real thing”, so all the hard-core rainbow chip fans will have to let me know how I’ve done. 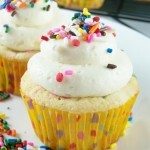 Either way, these cupcakes are pretty amazing (if I do say so myself!) =). Enjoy! 1. In a microwave safe bowl melt the white chocolate in 30 second intervals. Stir well. Continue to heat until all the chips are melted. 2. 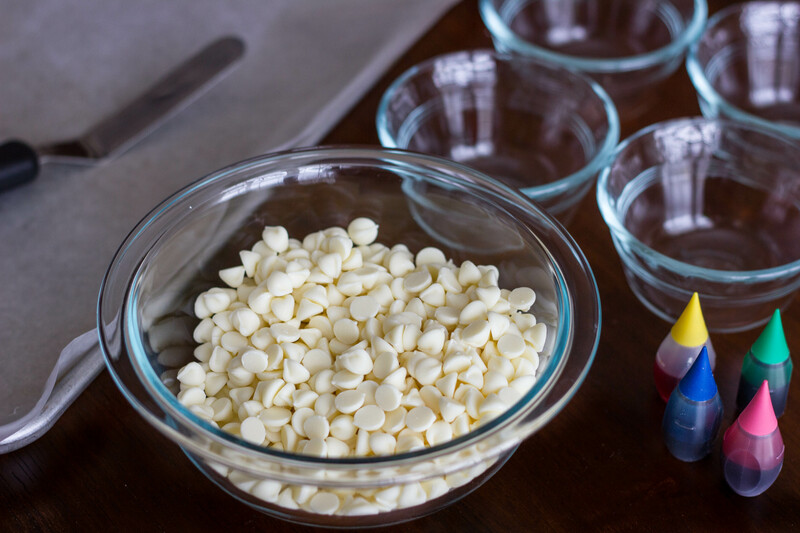 Divide the melted white chocolate into four small bowls. Add 5-7 drops of color into each bowl. Stir to combine. The white chocolate will seize up a bit but should still be pliable. If not, pop back into the microwave for about 10 seconds. 3. On a baking sheet covered with parchment empty out each bowl of colored chocolate. Using a spoon or an off-set spatula form it into a rough rectangle about 1/4″ thick. 4. Place in the freezer for about 10 minutes or until set. Once set chop up each color into little pieces. 1. To make the cupcakes: Preheat oven to 350F degrees. Line muffin tin with paper liners. 3. In a large microwave-safe bowl, melt butter in the microwave. Whisk in the sugar vigorously getting out any lumps – mixture will be gritty. Whisk in egg, yogurt, milk, and vanilla extract until combined. 4. Slowly mix in dry ingredients until no lumps remain. Batter will be thick. Fold in rainbow chips. 5. Divide evenly among cupcake liners using 3 tbsp scoop. Bake for 17-20 minutes or until centers are set and tops are golden brown. Allow to cool. Makes ~20 cupcakes. 1. In bowl of stand mixer with paddle attachment, beat butter and cream cheese until smooth. Add powdered sugar and beat until fully combined. 2. Beat in vanilla. Add heavy cream one tablespoon at a time until you reach a spreadable consistency. Stir in rainbow chips. 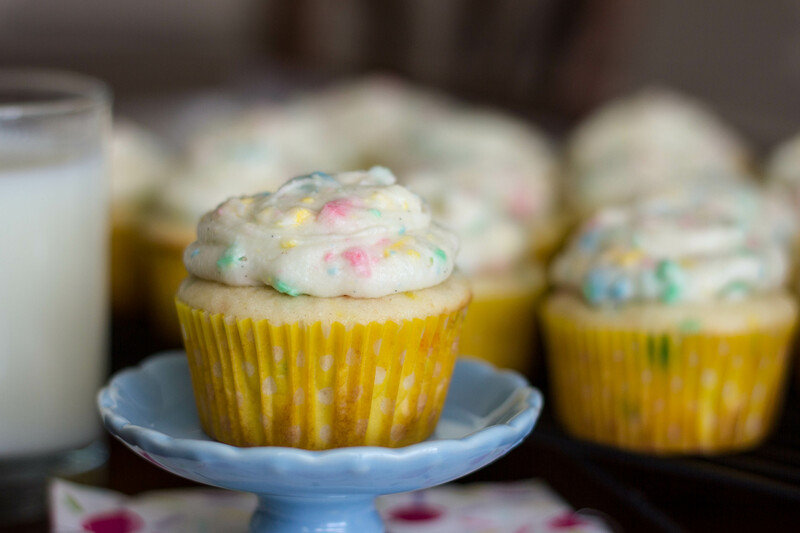 Spread (or pipe) onto cooled cupcakes.